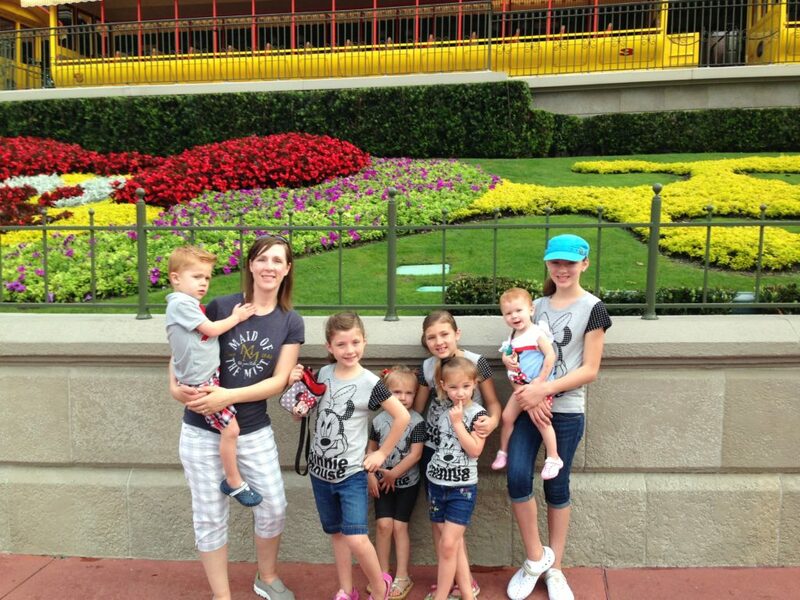 We just returned from a trip to Disney World over Easter Weekend and during Spring Break in Florida. On the Disney World Crowd Calendar, this week was listed as having insane crowds. But, this was the week we had available to go, so we decided to make the best of it. Though it was incredibly busy, and the most popular rides had 2 hour waits, we didn’t spend the day standing in line and, friend, I will tell you how. 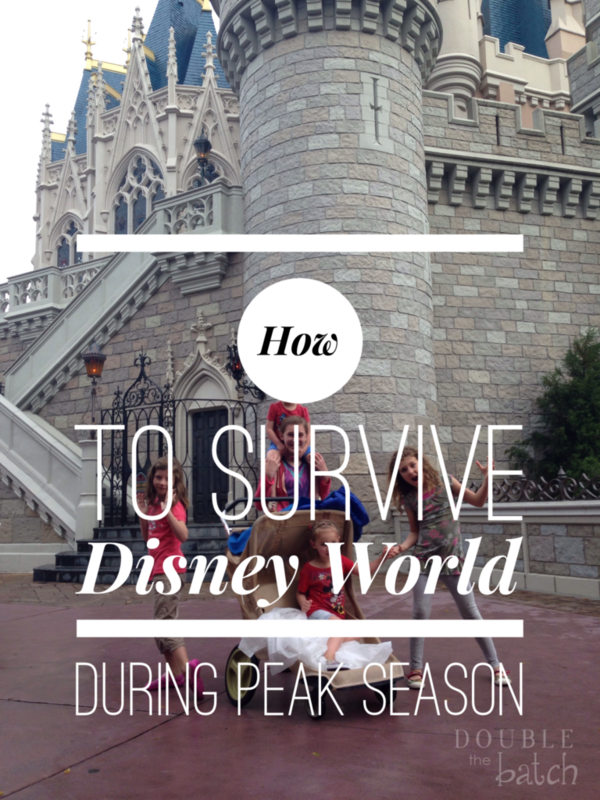 Here are 10 tips for how to survive Disney World during the Peak Season. 1- Schedule your Fast Passes as soon as you purchase your tickets. Fast Passes are included in your ticket price and you can schedule 3 Fast Passes online 30 days in advance after your tickets are purchased, and 60 days in advance if you have a Disney World Resort hotel reservation. There are certain rides you definitely want a Fast Pass for if you are interested in riding them. And the more in advance you schedule them, the better chance you have of getting the rides you want at the times you want. 2- Choose wisely which rides to use your Fast Passes on. The most popular rides for kids are the Seven Dwarf’s Mine Train, Peter Pan’s Flight, and Buzz Lightyear’s Space Ranger spin. If you have kids who are dying to meet Anna, Elsa, or Rupunzel, you’ll definitely want to schedule a fast pass for the Princess Fairytale Hall. Backstage Magic with Mickey Mouse might also be a good choice if you have Mickey fan. For adult rides, think mountain. If is has a mountain in it, it is popular, beginning with Space Mountain that will have a 2 hour+ wait followed by Splash Mountain and Thunder Mountain Railroad which had a 60-75 minute wait while we were there. We never waited in line more than 20 minutes with a Fast Pass, and often much less than that. 3- Take care of all your ticketing online in advance so you can walk into the park with your cards in hand, loaded with your Fast Pass selections, ready to go. This will help you avoid the ticketing lines, and especially the guest relations line that takes the longest since everyone in it has a special situation they are trying to work out. Walk right in and start riding rides. 4- Be at the park before the doors open. Experts recommend arriving an hour before the scheduled opening time, and 90 minutes early during the peak season. You can find the park’s opening times here. Disney World is different than Disneyland. After you park your car, you still have to take the Monorail or a shuttle around a lake to get to Disney World, as the main parking lot is the entrance to get into all 5 parks. Plan extra time to get to the park, take care of your ticketing needs (if you didn’t follow my advice in #3 😉 ), rent your stroller, use the restroom and be ready to run the minute the park opens. If you can afford to stay at a Disney World Resort, you will have the added bonus of being able to enter the park during “Extra Magic Hours,” giving you early and late access to rides before the general ticket holders are allowed to enter the park and after they leave. Awesome. Do it if you can. For those who are not staying at a Disney World Resort, those early morning hours are critical to getting on the rides you don’t have a fast pass for that will have the longest wait times. The most popular rides may not have even come up as an option for you when you tried to schedule fast passes online because they get reserved the fastest. Run straight to the Seven Dwarfs Mine Train or Space Mountain like you are running the 50 yard dash and ride it first. Then on to Peter Pan, Buzz, Thunder Mountain Railroad, and Splash Mountain if the wait times are still 30 minutes or less. That is golden. If you scheduled any of these on your Fast Pass, this will give you two chances to ride without a long wait. 5- Schedule your fast passes at the right time of day. The afternoon is going to be packed, everywhere. You want to be using your fast passes during this part of the day to avoid the insanely long lines. And once you have used all 3 Fast Passes, you will be able to schedule more Fast Passes, one at a time, for the evening hours at the Fast Pass Kiosks located throughout the park. The nice thing is, if you have your group all linked to one DisneyGo account, only one person has to wait in line at the kiosk and their card will allow them to schedule the whole group for another Fast Pass. So, everyone else can be getting food or using the restroom while one person gets you all set up for your next ride. The only downside is that the larger your group, the less likely you are to get the most popular rides to pop up as a Fast Pass option later in the day, but you can usually find something to keep you entertained and out of lines. 6- Find a spot early for shows you really want to see. You can find a calendar for the day’s events here. If there is an adult in your group who is tired and could use a nap, send them with a blanket to save a good spot while the rest of you keep on trucking. Wishes Nighttime Spectacular at the end of the day was fantastic! And super crowded. Save a seat for this (as front and center to the castle as possible so your view won’t be obstructed) if you can and you will also be able to see the Celebrate the Magic Fireworks show as well that follows shortly after. I LOVE the the Disney Festival of Fantasy Parade. To me, it is the most magical and happy part of the whole Disney World experience. You can usually find a spot along the parade route. But, checking the calendar in advance to know when and where it will happen will ensure you get a good spot to watch it from. And it can help you avoid the path it will be taking through the park, since you will not be able to use those roads to get where you need to go during the parade. 7- Download the Disney World Wait Times app. Gone are the days that you had to wander around the park wondering how long the lines were and where you should go. This app continually updates, telling you what the current wait times are at all the rides throughout the park. This is soooo helpful! You can make smart choices on where to go when you are not currently in possession of a fast pass. I can’t recommend this app enough for your time at the park. 8- If eating at certain restaurants is a priority to you, book your reservations in advance. You can book dining reservations 180 days in advance of your trip. You can coordinate your dining times with your fast passes and avoid waiting in line to be seated at the restaurants. If you are doing a character dining experience, (which I HIGHLY recommend!) you can purchase your tickets ahead of time through Get Away Today and your taxes and tips will be included saving you up to 10% (which is a lot when it comes to Disney Dining)! Use the promo code Uplifting10 for an extra 10% off. 9- Map out your day so you aren’t hiking back and forth between Adventure Land and Tomorrow Land all day. The less time you can spend squeezing your way through the crowds, the less aggravating the crowd size will be. Hit all the rides you are interested in one area if you can and then move on to the next. Keep this in mind when scheduling your Fast Passes. Try schedule two that are near each other in a row before moving on to a land further away for the third or vice versa. My 18-month-old daughter doesn’t actually fit any of the above description, so we seriously earned our child swap passes, but it is super awesome to be able to have 3 people in your group get a second ride out of one wait in line. This, of course, applies to kids who are too short for any given ride, not just babies. I had my 3-year-old son with me as well on our trip, and I wouldn’t actually recommend renting one. Haha! But there were plenty of magical Disney moments that made it all worth it. No matter where you stay, I highly recommend using GetAwayToday for all your reservations. Get Away Today specialize in Disneyland vacations and have personally stayed in all of the hotels they recommend. They will also beat any price you find on both hotel and Disney tickets, so it’s a no-brainer. Their customer service is the best around and they are the best place to find great deals on discounted Disney Vacation Packages or even just park tickets. It is so nice to be able to get everything you need for an awesome vacation all in one spot. They price match too which is great. If you go that route, use Uplifting10 for an extra $10 off!